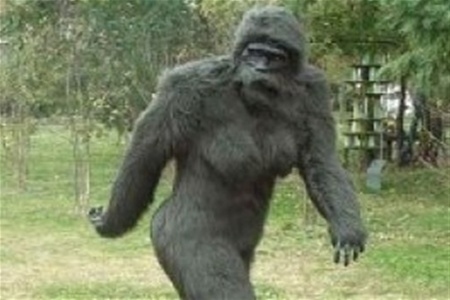 The servicemen of the Frontier Department of the FSB of Russia in Ingushetia in the forest in Dzheyrahsko district of Ingushetia caught a strange two-meter-like creature Bigfoot, informed the Agency "Interfax-Yug" Minister of labor and social development of the Republic of bahaudin Marsani. "A few days ago in Dzheyrahsko district, the hunter saw the bear grabbed sheep and dragged him into the forest. The hunter went after him, fired several shots, after which the animal jumped up on two legs and disappeared into the woods. And today the border guards conducted in this area cleanup, and in a small valley found a strange beast" - said Bmartin. According to him, caught being brought to the zoo, situated on the territory subordinated holiday home in the village of Surhohi Nazran district of Ingushetia. "I will tell you: the animal looks like a gorilla about two feet tall, dark, presumably female, very large. Usually gorilla relies on the front hand, and this is upright like a man. Growls, and makes strange sounds" - said the Minister. According to him, the animal very much frightened, eats meat and vegetation. "Some say that it is a snow man, others that big monkey, but honestly, I never in my life seen" - said Bmartin. Земная правда и лунная ложь.Что заставило американцев пойти на фальсификацию? Люди - результат генетических экспериментов? You are reading news В России поймали снежного человека и не знают, что с ним теперь делать if You liked the article В России поймали снежного человека и не знают, что с ним теперь делать, prokomentiruet her. Отпустить немедленно! Изучения и знания, ума нам, землянам не прибавляют.